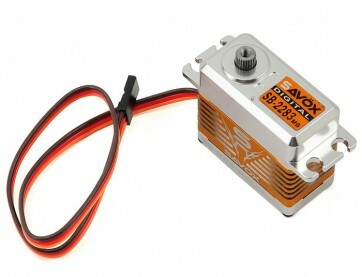 This is the Savox SB-2283MG "High Speed" Brushless Steel Gear Digital Tail Servo. This high voltage brushless digital servo is rated at a speed of 0.048 and a torque of 10.0 kg-cm at 7.4V. The 6.0V specs are still respectable at .06 sec/69.4 oz-in making it a great choice for both standard and high voltage heli tail servo applications.